Small-scale LNG projects (production and regasification capacity of less than 500,000 tonnes per annum) have reduced capex and are suitable for countries with low LNG consumption. For example Gibraltar has set up a small LNG import terminal with a total storage capacity of 5,000 cbm, which will directly provide fuel to the power plant located near the port. It is also true that it is becoming increasingly difficult to secure investment for mega LNG export projects by fixing cargoes on long term contracts. Due to the increasing number of LNG suppliers, importers are opting for shorter term volume contracts. This makes small scale LNG projects attractive, which are cheaper to build and where there is less risk. Although the number of small LNG export projects is currently limited new facilities are beginning to emerge. In the US for example, a small-LNG export project in Florida with three trains of 0.33 MTPA capacity has already been approved by the FERC. 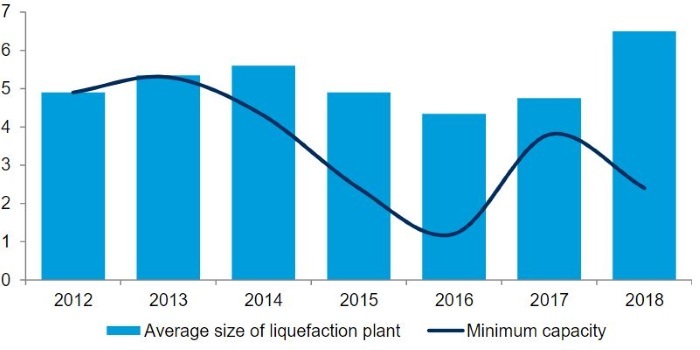 Asian countries such as Indonesia, Philippines and China, along with some European countries will also see growth in the number of small-scale LNG imports terminals and in turn this will create demand for small LNG vessels. On the export side, the list of LNG exporters will continue to diversify in the future as countries with moderate gas reserves develop opportunities to export LNG. In the near term, we expect countries in Africa to follow the lead set by the US by investing in small-scale LNG export projects. In turn, this will generate demand for appropriate shipping capacity. The existing fleet of small LNG (less than 50,000 cbm) vessels consists of 27 LNG carriers and 17 LNG/LPG carriers, plus some LNG bunkering units. But most of the LNG and LNG/LPG ships are engaged in petchem gas trades and they are not expected to service new small scale LNG export projects. LNG bunkering vessels are a potential source of competition, but the existing fleet is dedicated to LNG bunkering operations, while all of the vessels on order are also earmarked for LNG bunkering. In order to achieve first mover advantage, some shipowners have already started ordering small LNG vessels. Five small-scale LNG carriers were in fact ordered in 2018 and in 2019 and beyond we expect to see more orders for small LNG carriers. Small is therefore likely to become the new big for the LNG shipping market.